I'm not really a disaster movie type of guy. Sure, I liked Titanic, but I am one of the few people who would prefer not to watch 3 hours of it again. 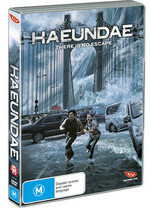 Haeundae is a disaster movie and South Korea's first. So I approached it with trepidation but it did surprise me in a few pleasant ways. The title of the movie comes from Haeundae, Busan, a place full of picturesque beaches and where tourist flock to soak up the sun. It is here that the many small threads of the story start. Man-sik is in love with Yeon-Hee, but hasn't told her that her father was killed in the 2004 Tsunami because of his mistake. Hyeong-Sik, Man-Sik's handsome younger brother, rescues a wealthy student and their friendship is frowned upon by a jealous suitor. Kim Hwi, a scientist, notices measurements indicating a possible mega-Tsunami about to hit Haeundae, but also has feelings for his ex-wife. Their daughter does not know that Kim Hwi is her real father. There are a whole lot of other fragments of stories, and all of it is a little superficial, as there really isn't enough time to evolve each one before an incoming Tsunami hits. There is a lot of sentimentality and strange slapstick comedy thrown into the middle, but when the Tsunami hits, it's CGI all the way. This is one of the reasons why Haeundae is one of the most expensive Korean film productions. The CGI is great and is equivalent to any good Hollywood movie, with people being washed away, whole buildings being destroyed, mighty explosions with people jumping at the last minute. It does make good watching but I thought that the Tsunami didn't hit soon enough. It felt like 2/3 of the movie was over before the Tsunami hit. I personally found this film unbalanced, with annoying underdeveloped sentimentality, designed to tug at the heart strings but evoked a lot of sighing. Perhaps because I knew what was coming up and was looking forward to it. Korean audiences will appreciate the family values, light hearted courting, community interaction while western audiences may appreciate peeking at Korean everyday life. All audiences will appreciate the magnificence of the tsunami wrecking all in its wake. As disaster movies go, Haeundae isn't too bad. The DVD features trailers and a making of featurette. Recommended for disaster movie aficionados.